The new Antonio’s Main Gate. We went back to Antonio’s to check out their wedding package for my brother’s wedding. As I posted a while back, I still think that nothing beats an Antonio’s Dinner in Tagaytay. It is still the best if you want to hold a grand wedding for your closest friends. Antonio’s beats any other places in Tagaytay in terms of great food and great ambiance. There is no set package in Antonio’s for wedding and they leave it up to you to order from the menu and the beverages menu. You should budget a minimum of at least P2,000/ head and it doesn’t make sense to go cheap on your guest if you decide to hold your wedding in Antonio’s. 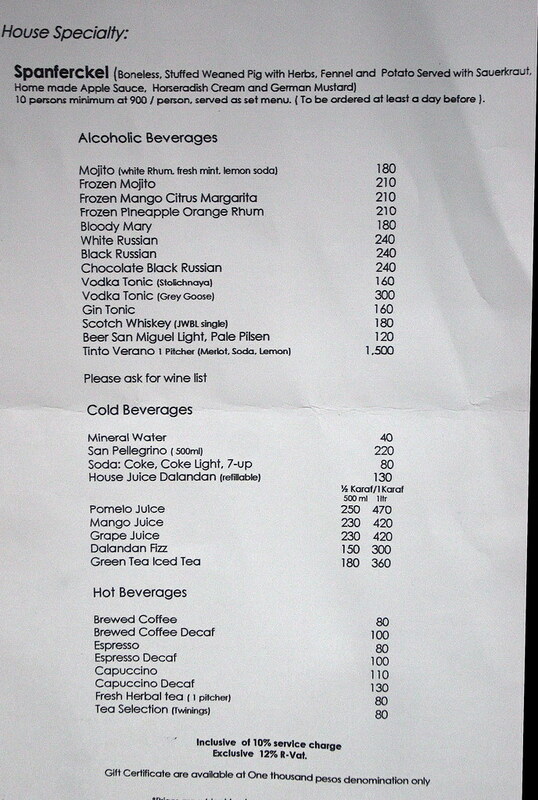 There is a corkage fee of P500/ bottle so they highly discourage you to bring your own wine. This was the view taken from the well manicured garden of Antonio’s. You can see the 3-level main house on the right and the huge door on the left is used for the grand entrance of the couple. You can use the garden for cocktails and this serves as the waiting area. Also, it is advisable to finish all the program in the garden and conduct the wedding reception in the main restaurant. It would definitely be a challenge to hold a program in the restaurant because of its 3-level structure so you will want to set up wide screens around the restaurant to stream the video of the program so as not to alienate your other guests. Overall, Antonio’s is the best ideal place for a wedding reception but be sure to willingly spend P2,000+/ head. Nothing beats an Antonio’s Dinner @ Tagaytay! Check out the rest of the Antonio’s ambiance…. I’ve always love this door ever since we discovered Antonio’s when it opened in 2003. Behind the receiving area is the bathroom above that usually everyone falls in love with. I love it then and even better now. As you look below in the second lower level, you’ll see the tables set in a lush garden with a koi pond to add to the overall romantic ambiance. You can decide to eat in the “main” restaurant with blue chandeliers. For a group dinner, our favorite spot is the patio of this main level resto. You can continue to descend down via the grand staircase to the third lower level. To your right is this high ceiling reception area which may be good for 20-30 people. I could imagine doing the wedding program here but you need to stream the programs via a wide screen to other areas of the resto. To your left, group of tables with their own unique table setting and ambiance. I’m not really fascinated with the table setup in this part of the resto maybe because of its low ceiling. It does not give you a feeling that you are eating in a garden. This table has an interesting chef painting at the end of the wall. I’ve always wanted to ask Antonio’s one of these days, the story about the painting. As you go down further, this staircase now leads to the garden. Here is a view of the garden from the staircase. This is the first time I’ve seen it . They have done a great job with creating and maintaining this garden. So bro, what’s your decision? Will you go for Antonio’s? Call Antonio’s Restaurant at +63918-899-2866 for reservations! Expensive? Yes. But honestly, the experience of having a wedding reception at Antonio’s is priceless. The food, the place and most definitely the service cannot be beat. We decided to have our reception in Antonio’s after I read your first blog post in 2006. We instantly fell in love with the place, the food and the ambiance. They have the best service too. What else can you ask for? I’m really excited. It’s a treat for our love ones — the first class dining experience that they can remember. Indeed its going to be priceless. I want to thank you because through this blog we discovered Antonio’s. A simple thanks won’t be enough. Wow! I never thought Antonio’s for a wedding reception venue. I think that the place could use some more tables and chairs! Hahaha.. 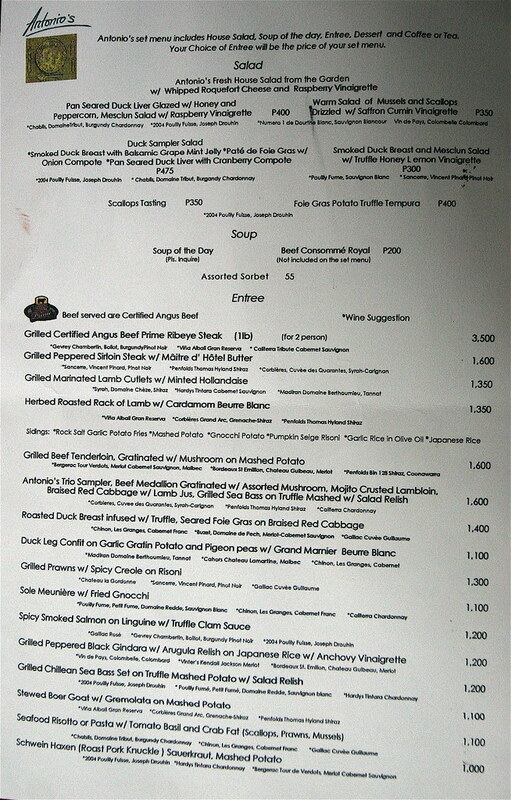 But I do love Antonio’s – I swear it’s one of the best (if not the best) fine dining places here in the Philippines. I love their steaks!! Antonio’s owner is an old friend of mine. Tony Boy, wife and family is here in the U.S. and we will are excited to see them in the upcoming weeks. I visited your resto last May 8, 2003…..I was on a date…..I was late actually…. someone even called my mobile to ask if we were still coming or not…it was way past lunch already… when we got there my date had to smoke pa! (great) so we were waiting right outside the main dinning area, then you called out my name “chiqui?” I of course acknowledge and you showed us to the patio. I didn’t know who you were then, but of course I saw the embroidery on your left chest that read “Chef Escalante”. You helped us thru the menu personally….that made us feel really special…really special. Thank you for the wonderful experience of dinning at your beautiful and memorable resto. you are soooo correct, anton, about antonio’s being the best. it certainly is among the TOP 3 restaurants in this country and tonyboy escalante deserves ALL the accolades he’s getting for a job so superbly well done. he’s a very good friend of mine and i can assure you he and his mrs are going strong. whatever negative stories you hear about antonio’s chef patron are just the usual stories about successful persons circulated by those who are on the outside looking in and pretending as if they know something when in fact they are so clueless. i live near tagaytay and usually i spend most of my weekend there but i havent been to antonios since i know its very expensive to dine in i actually have no idea how much if for example i will dine in for lunch.. do you have any idea about the usual range? i think theyre more costly than restos in tagaytay highlands.. thanks! hi,we are planning to have lunch for 3,how much will it cost me?do you accept credit card? Hi everyone. I am trying to help out my friend for her wedding, what is the nearest beautiful church to Antonio’s? how much are the wedding packages in antonio’s? were you able to find out? thanks! how much will i spend for 100 visitors? Well, I was planning on going somewhere else tomorrow night for my GF’s birthday. Medyo steep ang Php 2,000 per head. BUT I JUST COULDN’T FIND A NEGATIVE COMMENT ABOUT ANTONIO’S IN THE INTERNET!!! To top it off, my bro suggested this resto for a Tagaytay dinner. THAT WAS THE LAST STRAW. So I called the cell, spoke to Michelle, and booked dinner for 2 tomorrow night. How much does a typical breakfast meal at antonio’s would usually cost? I haven’t been there and I am planning to take my visitors from the US on the weekend? Any ways for us to get a copy their menu? Thanks. we loved antonio’s. we will come back too this grand place in tagaytay. hi.. i am planning for a wedding next year round july..
what’s the most affordable package you could give me?.. The crew is not honest, i lost my ipad der last nov 1 2010. Its us and the waiters are only der wen we have our breakfast. FYI: DONT LEAVE YOUR BELONGINGS DER IT WILL NOT COME BACK TO YOU!!! MAGNANAKAW MGA WAITERS DYAN!!!! oohh..thats harsh.. are you sure the waiters stole your IPAD? let’s not judge the waiters at Antonio’s like that. 🙂 peace! Well JGC. Just like in any other public place, valuables like your IPad shouldn’t be left unattended.